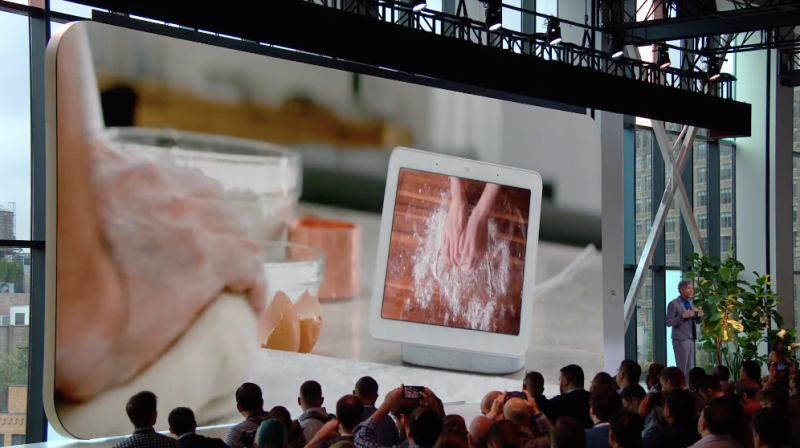 Just a day after Facebook announced its virtually feature-less Portal smart display, Google debuted one of its most loaded IoT devices ever. The first Google Home with a display is available for pre-order starting at $150. Despite privacy concerns and a general pointlessness, almost 27 percent of U.S. households have brought a smart assistant device into their home. This has led more people to try out IoT accessories like smart lights, security cams, and microwaves that can be controlled with voice commands. While that market grows, screens are immediately more useful, especially if you like to cook. Stick that smart speaker in the kitchen and watch along with cooking videos or just put on something in the background. Google’s playing catch-up with Amazon and Lenovo when it comes to smart displays, but overall the Home line of smart speakers is leading the market. And there’s good reason for that. Google Assistant is a strong voice assistant and we’ve had solid experiences with the standard Home, the Home Mini, and the more top-of-the-line Home Max. Considering the few functions that a smart speaker actually serves and how similar features are across devices, it really comes down to choosing which one is the best. With the addition of a display on the Google Home and a few excellent features, it’s a good bet that this will be the one. The Google Home Smart Display is quite similar to Lenovo’s Android-powered competitor that came out this Summer. You can control various functions in your smart home through the Android Things platform, constantly monitor the weather and time, and access the web. And this is Google’s own product, so you won’t have any problems using YouTube. That’s a big problem when it comes to Amazon’s Echo devices, the two companies have been bickering and boxing out customers for ages. The Google Home Hub comes with a version of YouTube that’s optimized for the display and to work with your voice. You also get a trial of YouTube Premium and Music free for six months. Other optimized services include Search, Maps, Calendar, and Photos. The photo feature may wind up being one of the most useful. Live Albums automatically uploads photos from your Google Photos account to display in on the Home Hub, making it a nifty little photo frame. Home view lets you control all of your internet of things devices with one clean interface. You won’t need to juggle multiple apps for each device and it’s compatible with 200 million devices from over 1,000 brands. A Nest doorbell will automatically display a video feed of who’s ringing at the door. The back-facing speaker has the same cloth mesh covering we’ve seen on other Home devices and it’s available in green, pink, dark grey, and white. You can pre-order the Home Hub for $150 starting today but we don’t have worldwide release dates yet. It comes to the U.S., UK, and Australia on October 22.